Can you name the seven virtues? If you haven’t given much thought on Prudence, Temperance, Justice, Fortitude, Hope, Faith and Charity, Robert P. Lockwood’s book might give you something to think about. Lockwood breaks down the virtues into their own chapters and during the course of 140-plus pages, used a myriad of personal stories that stretch from being a boy and lessons learned from his father (he refers to as Old Man) to the mores recent experiences of being a grandfather of twins. A lot of the stories on everyday activities, such as a love for baseball and eating in diners, some traveling and many funeral stories of friends and family alike are told, illustrating how we can find lessons and a better life in the seven virtues. Not all stories have a clear point or will touch your interest. Often, his viewpoint is sentimental and wistful for an age gone by, which a younger reader may not identify with. That’s fine, as there are many different stories devoted to each virtue and during each chapter. At least one story made me understand a new and better way of looking at each virtue, applying them to everyday life, and living better in service to God through these virtues. The books may be best read by the Catholic who wants a refresher, to find new meaning and understanding in his faith and look to the virtues that have been around for a long time, yet can serve us in the modern day and everyday. 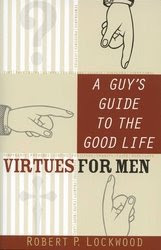 “A Guy’s Guide to the Good Life - Virtues for Men” by Robert P. Lockwood is available at The Catholic Company.